Completely waterproof patented protection for prosthetic legs. Comes with pump to remove air and create a vacuum-seal. Once air is removed, drypro can't be taken off unintentionally and water can't get inside. 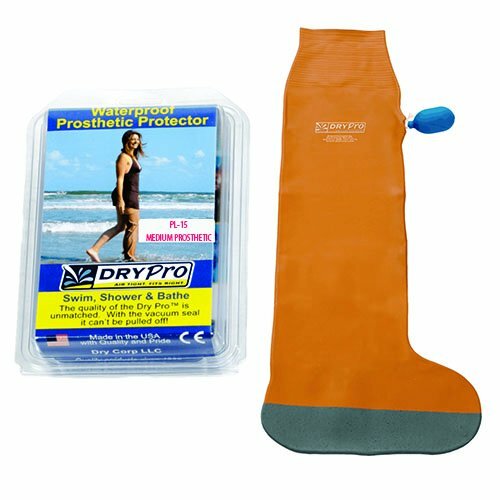 Bathe, shower, or even swim without worry of infection or damage to prosthetic leg. •	1. Circumference: 15"-19" (38-48 cm) ** If measuring a circumference right at 15" it is better to size down to ensure the product stays waterproof. •	2. Length: 35" (89 cm) ** If the cover is too long simply bunch up the extra material and pump out all the air. The extra latex will shrink down and conform to the shape of the users prosthetic removing all extra length. •	5. WARNING - Do not use if unable to create a snug vacuum seal. If you have any questions about this product by DryCorp, contact us by completing and submitting the form below. If you are looking for a specif part number, please include it with your message.